Presentation Sections are elements that can be used to customize and organize your presentation. 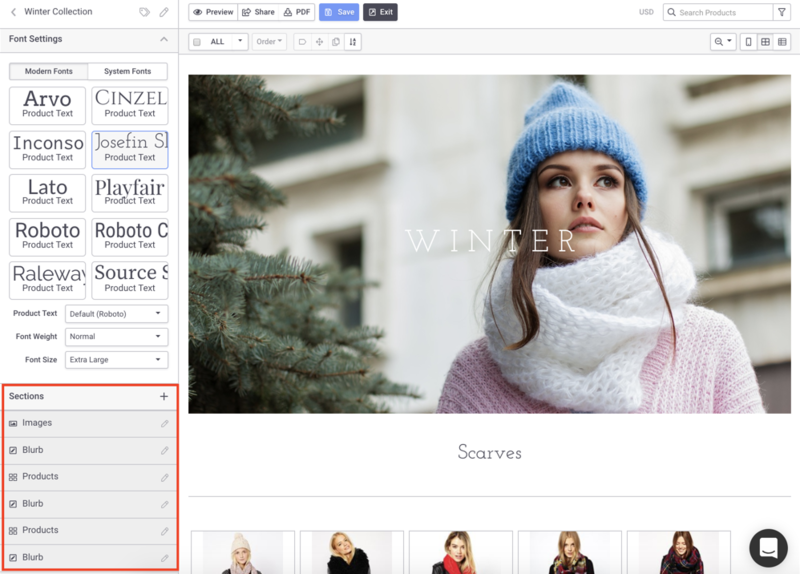 They allow you to insert text, images, and videos which integrate visually with the presentation interface, making your catalogs really stand out. 1) Open a Presentation and scroll down the left hand menu to the Sections heading. A simple container box that allows you to group Products and apply uniform discount, Ship Date, and Cancel Date. A full-width image container that maintains set proportions and allows text to be added. Useful as a banner or hero image. A full-width Youtube video player. Paste the video URL in the Video Link field. Note: If your video is not hosted on Youtube, you can still use the Blurbs to embed it in a normal video player. A horizontal line that separates out your sections. A basic text editor which also allows for inserting in-line images and videos. 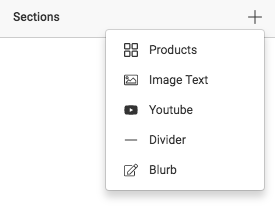 Note: Blurbs previously merged a text box with a products box, but they are now separate elements.